In a previous article I outlined the reasons why I consider stock buybacks to be inferior to dividends. Nevertheless it pays to know which the largest repurchasers of their common stocks are. I am also a supporter of companies doing both stock buybacks while regularly raising dividends. The decrease in buybacks was about 73% in comparison to the first quarter of 2008. 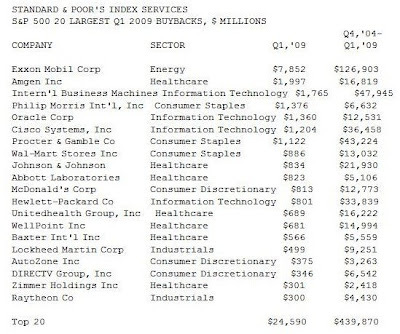 S&P 500 companies spent $30.8 billion buying back their own stock in 1Q 2009 versus $113.9 billion in 1Q 2008. It’s interesting to note that several prominent dividend stocks appear on the list. Exxon Mobil (XOM) accounted for the majority of buybacks in the first quarter, after purchasing $7.85 billion worth of its own stock. This was slightly down from the $8.845 billion spent on buybacks in 4Q 2008. In comparison the largest oil and gas company in the US paid only $1.98 billion in dividend payments for the quarter. Exxon Mobil has been consistently increasing its dividends for 27 consecutive years, with its most recent dividend payment being 42 cents/share. Check my analysis of Exxon Mobil (XOM). International Business Machines (IBM) was the third largest company repurchasing its shares, after spending $1.765 billion in the first quarter 2009 and $47.945 billion since 2004. This was higher from the $0.74 billion spent on buybacks in 4Q 2008.In comparison “Big Blue”, as traders on the NYSE call this global tech behemoth, spent only $675 million on dividends in the same quarter. IBM has been consistently increasing its dividends for 14 consecutive years, with its most recent dividend payment being $0.55/share . Check my analysis of IBM. Procter & Gamble (PG) spent $1.122 billion on buybacks versus $1.215 billion on dividends. In comparison the company spent $1.332 billion on share buybacks and $1.239 billion on dividend payments. The money spent on buybacks translates into 38 to 44 cents/share for each of the past two quarters. This provider of branded consumer goods products worldwide has spent over $43 billion on share buybacks between 4Q 2004 and 1Q 2009, which was much larger than the amount of total dividends paid for the same period. Procter & Gamble is a dividend aristocrat, which has been increasing its dividends for the past 53 consecutive years, with its most recent dividend payment being 44 cents/share . Check my analysis of Procter & Gamble (PG). Another notable company on the share repurchasing front is Johnson & Johnson (JNJ). The company repurchased $834 million worth of stock in 1Q 2009 versus $878 million bought in 4Q 2008. The money spent on buybacks translates into 30 cents/share for each of the past two quarters. In comparison this healthcare company spent $1.273 billion on dividends for each of the last two quarters. JNJ has been consistently increasing its dividends for 47 consecutive years, with its most recent dividend payment being 49 cents/share. Check my analysis of Johnson and Johnson (JNJ). McDonald’s (MCD) returned $813 million and $553.4 million respectively on stock buybacks and dividend distributions in the latest quarter. The stock buyback translates into $0.70/share for the quarter, which could have been paid as a cash dividend. McDonald’s has been consistently increasing its dividends for 32 consecutive years, with its most recent dividend payment being 50 cents/share. Check my analysis of McDonald’s (MCD). Wal-Mart Stores (WMT) returned $886 million and $1.067 billion on share repurchases and dividends for the latest quarter. The money spent on buybacks translates into 22.50 cents/share for the latest quarter. In comparison, the world’s largest retailer returned $932 million in the form of dividends and zero in the form of stock buybacks in the previous quarter. Most recently it announced a new share repurchase program that gives the company authorization to repurchase $15 billion of its shares. Wal-Mart (WMT) has increased its quarterly dividend in each of the past thirty-five years, with its most recent dividend payment being 27.3 cents/share. Check my analysis of WMT. Overall, the money spent on stock buybacks, does increase earnings per share in the long run, which also leaves room for faster dividend growth. This could also lower total dividend costs paid by corporations down the road. In the end I enjoy a balanced approach, where companies do both dividends and share buybacks. My preference is on dividends, as I view share buybacks as a way to share the wealth with shareholders only during good times. The recent Standard and Poors report shows the steep declines in share repurchases in the first quarter of 2009. This confirms my theory that stock buybacks are similar to special dividends, and should not be taken into consideration when evaluating the income attractiveness of dividend stocks. However while both methods have their pros and cons, when used carefully, they could strongly add to the total returns of long-term shareholders.